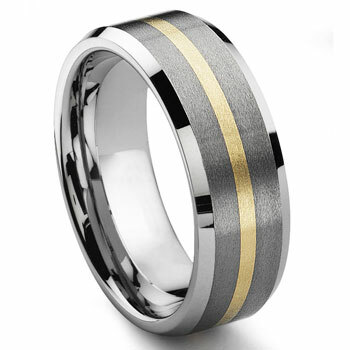 A solid 14k gold inlay wrapped around a masculine tungsten carbide ring, creating a breathtaking men's ring design. The ring features beveled high polish edges and a flat brush finish center. The tungsten part of this ring is giving protection to the gold inlay from the outside and support from the inside. It makes the ring more durable then any traditional band ring made from only gold or silver. It will never bend out of round and the gold will get less scratches from daily wear. I bought this for my husband for our ten year anniversary...and he loves it! It is just as it pictured. It is beautiful and I love seeing him wearing it! We purchased the wrong size at first. Exchanging the ring was quick and painless. The ring is exactly what my husband to be was looking for. I will recommend Titanium Kay to anyone looking for a Tungsten ring. I bought my Husband a new wedding ring for Christmas. I was searching for a specific style my husband and I had seen a couple of years ago in a store. They no longer had it, but you did. I was a little nervous buying jewelery online, but you met all my expectations and my husband received the ring he wanted. This is the third item I have purchased from Titanium Kay. Their products are ALL fantastic and great quality. The customer service is second to none and the prices are more than competitive. This holiday season, and every season, shop with Titanium Kay and you will be super satisfied!!!!! I had a few styles picked out on this site but this was the ring my fiance liked the most. I took the advice of the other reviewers and ordered a 1/2 size smaller (normally wears a 10 1/2 but ordered a 10). The ring fit perfectly and he liked it better in person than in the picture. Thanks so much for making my "special" shopping so much easier.